THE marine carbon cycle is undergoing rapid changes. An excess of unregulated carbon will eventually acidify the oceans. A new study demonstrates that fish have the potential to save the marine carbon cycle. Until now scientists believed that the calcium carbonate (CaCO3), which makes seawater alkaline, came from the external skeletons of microscopic marine plankton. But these carbonates are not water-soluble and sink to deeper depths forming sediments which stay intact for millions of years. This led researchers from the universities of Exeter, Miami, Ottawa, British Columbia and East Anglia to investigate what makes the sea alkaline at shallower depths (500-1,000 m). They found fish responsible for producing three to 15 per cent of marine calcium carbonate. Fish drink calcium- and magnesium-rich seawater. To regulate the body's fluid balance they excrete the excess salts. As imbibed seawater passes through intestines, calcium and magnesium carbonates are produced using endogenous (metabolically produced) carbon dioxide. 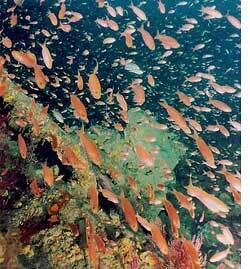 Moreover, fish excrete forms of calcium carbonate that are soluble at shallow depths. For the study, published in the January 16 issue of Science, the researchers transferred the European flounder fish (Platichthys flesus) from freshwater to seawater. This fish can adapt to varying levels of salinity. Within three hours, X-rays showed accumulation of carbonate precipitates had begun. These were excreted as pellets covered in mucus. The subtropical Gulf toadfish (Opsanus beta) was similarly studied. To establish a link between temperature, body mass and the rate of carbonate excretion, the researchers studied various classes of fish based on their sizes and abundance in the oceans. Results established the fact that fish are important regulators of the marine carbon cycle. In fish, metabolic rate increases with increase in temperatures and decrease in body size. Smaller fish at higher temperatures (warmer climes) have high metabolic rates, which means increased production of carbon dioxide and more carbonate production per unit body mass. Planktons depend on calcium carbonate from seawater for their external shells, which are recycled into the sea after they die. Increasing global temperatures will affect the organisms adversely. But such conditions will be apt for fish to produce more carbonates, thus regulating the carbon cycle.